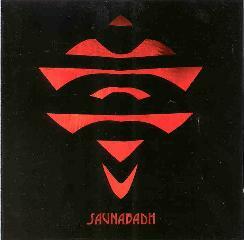 Saunabadh is a new heavy rock trio from Finland and this is 3-song, 16 minute CDEP is a tantalizing taste of things to come. The band consists of former Kingston Wall bassist Jukka Jylli, Janne Lehto on guitars, Esa Lilja on drums, and Jessica on vocals. The music is very much in the Kingston Wall spirit with guitarist Lehto clearly influenced by Petri Walli. Saunabadh is a bit more on the metallic side but when Lehto takes off he can shred big time, and on "Frankly, my dear..." he blasts into a great psych jam. Jukka Jylli's presence is prominent with he and drummer Lilja making a potent rhythm section. Jessica's vocals fit the music well, but she wisely stands aside when the band goes into a jam. It's hard to tell from this short introduction but it sounds like we've got a follow up to the great Kingston Wall that isn't a mere copy. Indeed Saunabadh seems to have taken the spirit of KW yet established an identity of their own. For more information you can email Saunabadh at esa.lilja@helsinki.fi.